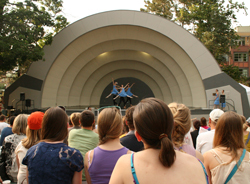 The Boulder Ballet’s traditional Ballet in the Park is back and ready to help you celebrate Father’s Day! This is a super fun family-friendly event. Bring a picnic and delight in a beautiful summer evening while enjoying this annual summer treat. June 16, 2013 in Broomfield. More information here. Event starts at 7pm. Come early to enjoy a picnic.